Winter kicks off with the Christmas-New Year holidays when all of the top tourist destinations will be full of people. If you're looking to enjoy those places without the crowds, you will find them much less crowded after the new year begins. If you're looking for California places that are especially nice to visit during winter (December, January, and February), you'll find those listed below. Some of them are too hot to visit in the summer but pleasantly warm when you're feeling cold. Others are places to go to for winter snow play. Others put on some travel-worthy seasonal events or are good places to catch a meteor shower. Death Valley is hotter than the proverbial firecracker in summer, making it a place most people avoid. It finally cools off in the winter - but it stays warm enough to make it a great place to go if you're feeling a little too cold. Winter is also the busiest time in Death Valley, and you may need to reserve a hotel room two to three months ahead of time to avoid coming up empty-handed. To get started with that planning, start by finding out everything you need to know about planning a Death Valley trip. Winter is both the worst and the best time to visit Disneyland. If you want to enjoy the theme park without the crowds, wait until the year-end holidays are over. After that, January and February are two of the best months of the year to go for short lines. If you can time your trip to avoid rainy days, you'll also enjoy the sunny California weather that Goldilocks might describe as "Not too hot, not too cloudy, but just right. "​ Get started planning your Disneyland winter trip right now. It may be hard to believe this if you hadn't experienced it yourself, but Newport Beach and neighboring Orange County towns put on some of the best Christmas festivities in Southern California. They include a Christmas parade made solely of lit-up yachts and lighted homes that are best seen from the tranquil waterways that run behind them. Newport Beach makes an excellent base for your holiday in the OC. Find out what you need to know to plan your Newport Beach getaway. Pacific Grove is a tiny town just next to Monterey, on the quieter side of the peninsula. Any time of year, you can take a beautiful drive along the coastline and admire the charming, nineteenth-century cottages in town — or watch the sunset from Lover's Point. Pacific Grove is only one of many places to go for butterfly-watching. You can also find other places to see monarch butterflies in California. The Pasadena Rose Parade is one of the most spectacular parades in the country, held annually on New Year's day (except when the first is a Sunday, and it moves to January 2). Every Rose Parade float is covered entirely in natural materials, and the float builders can use so many blossoms that they create a temporary worldwide floral shortage. This over-the-top extravaganza is a classic that's well worth planning a trip around. The parade also generates a lot more things to do, enough to keep you busy for several days which are all detailed in the Rose Parade Guide. Because the parade is so well-known, it's important to start planning months ahead of time by using the Pasadena getaway guide. In the winter, you may be lucky enough to catch a snowfall in Yosemite Valley - or see Yosemite Falls frozen solid. 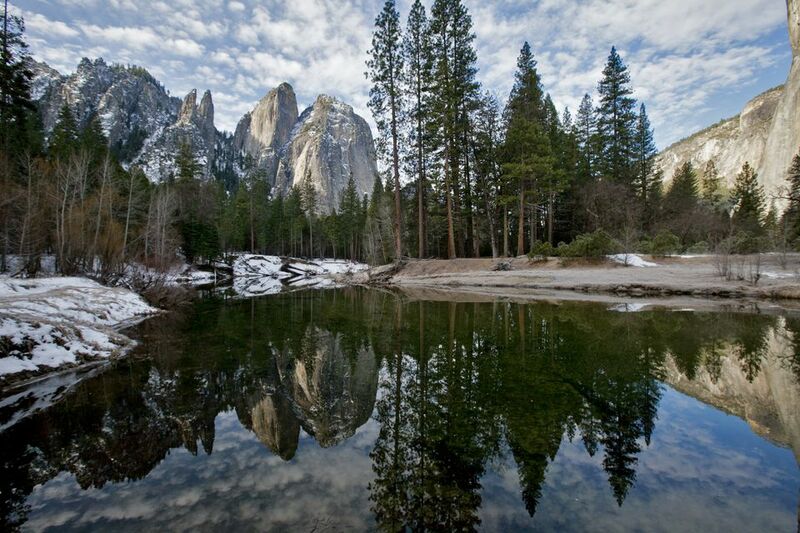 And those are just a few of the things to do at Yosemite in the winter. But don't worry about getting snowbound. The Yosemite Valley itself is at an elevation where it seldom snows too much, and when it does, the snow doesn't stick around for long. Winter is also the season for Yosemite's food and wine events, Taste of Yosemite and the Grand Grape Celebration. December brings out California's best Christmas celebration, the Bracebridge Dinners. Every winter, thousands of northern elephant seals gather on the beaches, returning from an extended stay at sea. Within just a few short weeks, males fight to become the dominant bull, females come ashore, babies are born and weaned. The spectacle starts in late December and lasts a couple of months. You can see the elephant seals at Ano Nuevo State Park during a getaway to Santa Cruz, or stop by the breeding colony at Piedras Blancas on a trip to Hearst Castle. Seeing a meteor shower is something that should also be on your bucket list, and California has some great dark sky destinations for watching them. In December, the Geminid meteor shower happens mid-month creating a multi-colored display of white, yellow, and even blue, red and green streaks through the sky. Check the exact dates for this year. Some of the best dark skies spots to watch the showers in California include Death Valley, which is a good place to go in the winter in general. You can also watch them anywhere that's far from city lights like Big Sur, Mendocino, and locations along Scenic Highway 395 in Eastern California.